I've always respected Bill Gates for leaping beyond the desktop into the server software market in the 1990s, where customers craved alternatives to Unix (expensive) and NetWare (aging). But like many folks, I also viewed Gates as desktop monopolist, who once had the power to stop PC makers from adjusting even a single icon on the Windows desktop. Fast forward to the present and my views on Gates have changed for the better. I’ve always respected Bill Gates for leaping beyond the desktop into the server software market in the 1990s, where customers craved alternatives to Unix (expensive) and NetWare (aging). But like many folks, I also viewed Gates as desktop monopolist, who once had the power to stop PC makers from adjusting even a single icon on the Windows desktop. Fast forward to the present and my views on Gates have changed for the better. My inflection point came as I read Walter Isaacson’s biography of Steve Jobs. A friend — Five Nines Technology Group CEO Nick Bock — beat me up pretty good in early November when he found out I had yet to read the biography. I finally took Bock’s advice and read the book. I couldn’t put it down. The 63o page book’s most dramatic moment didn’t involve Jobs and his family, nor Jobs and Apple. Instead, it involved Bill Gates, Steve Jobs and a final meeting in Jobs’ Palo Alto, Calif., home three months before Jobs died. Isaacson recounted how Gates visited Jobs in May 2011. Moving. Funny. Depressing. Inspirational. The duo spent three hours together, Isaacson recounted, reminiscing about the industry they built together. Throughout the biography, Jobs comes across as a tragically flawed individual — brilliant yet arrogant, distant yet caring, charming yet rude. He never changed, even as death approached. Meanwhile, the Jobs biography shows how time has changed and perhaps even softened Gates. The old software wars have been replaced by his philanthropy and genuine desire to wipe out disease. And the entry about Gates’ final trip to see Steve Jobs nearly moved me to tears. Seriously. I first met Gates around 1994 when I interviewed him for InformationWeek. Classic Gates, he called some of my questions stupid (perhaps they were…) but he gradually warmed up during the conversation. I always respected Gates for disrupting the server market — where Unix and NetWare had been entrenched. But I also despised Microsoft’s competitive moves in the desktop market in the 1990s, which Gates had personally choreographed. Still, those days are over. 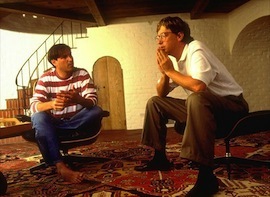 As I read Isaacson’s biography of Jobs, I kept thinking to myself that Bill Gates came across as… well… remarkably human.